Zodiacal dust is the name given to the ~µm-sized grains of silicates that can be found between the planets in the Solar System. It has a variety of sources, including comets, asteroid collisions, and interstellar dust trapped by the Sun’s gravity. This dust reflects and re-emits light from the Sun, and is a source of noise for many astronomers trying to look through the zodiacal dust at Galactic and extragalactic sources. This is a strong motivation for modeling the zodiacal dust, because if we understand the distribution of the dust, we can subtract its contribution from observations. However, zodiacal dust is also worthy of study as a part of the Solar System’s debris disk. The distribution and composition of the dust contains clues to the recent history of the Solar System, including the movements of planets, comets, and asteroids. The authors of this paper model the zodiacal dust and attempt to determine the relative contributions of the various sources of the dust. Rowan-Robinson and May constructed their model by assuming that the different sources of the zodiacal dust are responsible for different structures in the dust distribution. For example, the dust produced in the asteroid belt forms bands between 1.5-3 AU and a fan-like distribution extending to 1.5 AU. This kind of distribution can be seen in Figure 1, in which the y-axis indications intensity of the dust emission and the x-axis indicates the latitude of the dust (angular distance from the ecliptic plane). The intensity is higher in the ecliptic plane, then decreases as the dust spreads out from there. Dust-producing comets orbit the Sun between 5-30 AU and contribute to the inner fan as well as a more extended fan distribution. Interstellar dust grains have high velocities and are mostly unaffected by the gravity of planets, so they are assumed to have an isotropic distribution. 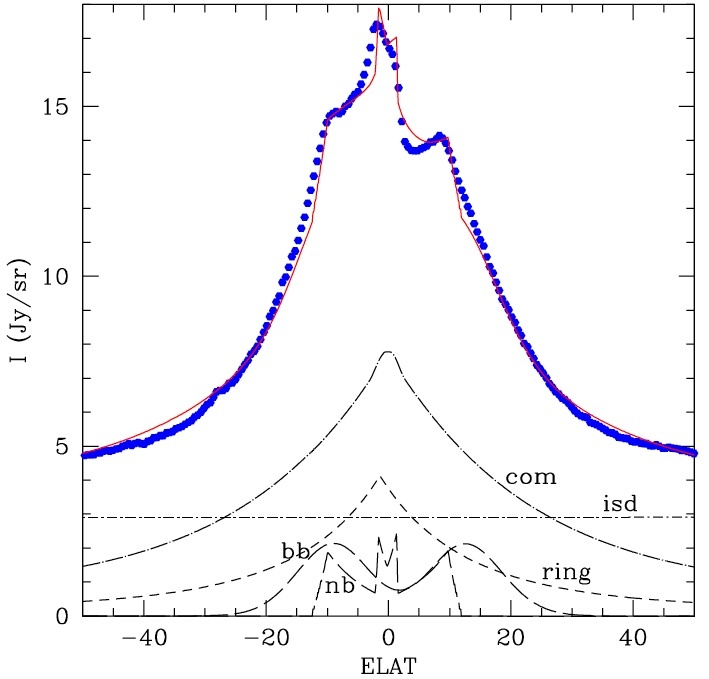 The authors calculated the infrared emission due to the model distributions. By varying parameters of the assumed distributions, they could fit the model emission to infrared observations of the zodiacal dust from the Infrared Astronomical Satellite (IRAS) and the Diffuse Infrared Background Experiment (DIRBE) instrument on the Cosmic Background Explorer (COBE) satellite. Figure 1 shows a comparison of the DIRBE data and the fit from the model. Figure 1: Comparison of DIRBE data (colored dots) with model (black lines) at 4.9, 12, 24, 60, and 100 µm. The y-axis shows intensity. The x-axis shows the latitude of the observation. Figure 2 shows a comparison of the IRAS data with the model after the fan component has been subtracted. The black lines shows various other structures in the dust that contributed to this model, including rings, blobs, and the interstellar dust component. 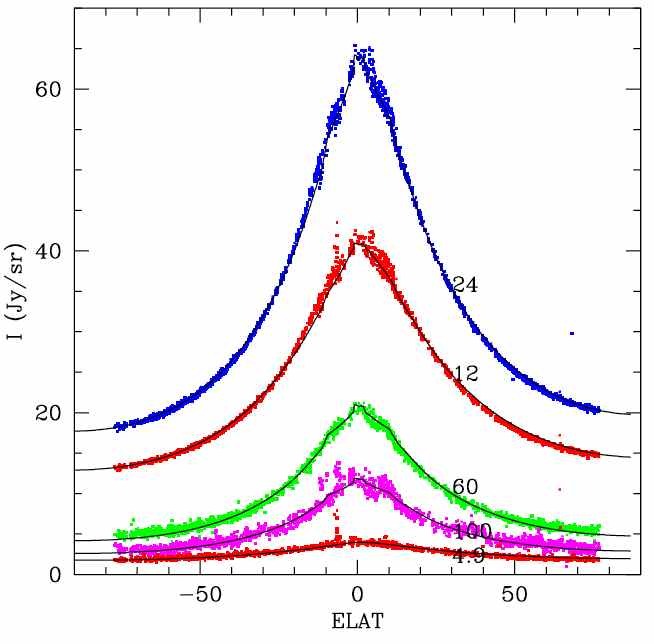 Figure 2: Comparison of the IRAS Data at 25 µm (blue dots) with the model (red line) after subtraction of the fan distribution. The black lines indicate the models of other structures in the zodiacal dust. Rowan-Robinson and May find that the relative contributions of the comets, asteroids, and interstellar dust to the density of fan-like distribution at 1.5 AU are 70.4%, 22.2%, and 7.5%, respectively. They use these results to calculate the mass density in the ecliptic plane at 1.53 AU for the cometary, asteroidal, and interstellar dust. The authors wrap up by calling for a new ground-based study of zodiacal dust, as well as dynamical simulations and direct observations by spacecraft past 5 AU. I'm a graduate student in the Physics Department at the University of Maryland, Baltimore County. I do my research at NASA/Goddard Space Flight Center with Marc Kuchner. I'm writing a model of debris disks to understand the way disks and planets interact, which will help us find exoplanets using images of disks. My model includes collisions, so I spend a lot of my day thinking about asteroids smashing into each other.